Final step after nail colour is dry. Essential for protecting nail colour. Extends the life of application. Creates a hard gloss “ Final Finish “. Hides imperfections caused by pre – dry knocks. Creates buffer to wearing edge. Make sure nails are thoroughly dry, then apply a thin coat. Focus on sealing free edge. A finishing coat is the Final step after nail colour is dry. It is essentialfor protecting nail colour, extending th elife of application and creating hard gloss “final finish”. An added bonus is hiding imperfections caused by accidental knocks before colour is dry. 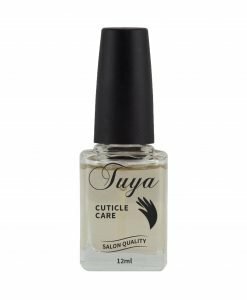 Secure nail colour by sealing free edge of nail to protect from peeling and wearing away of edge colour.